The curtains get down at yet another Indian Super League city for the season as Kerala Blasters hosts NorthEast United at the Jawaharlal Nehru Stadium of Kochi in their final game this edition. 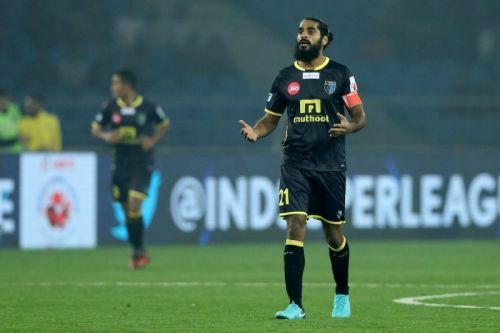 Kerala Blasters are going past a season with very few things to remember. Finishing 9th on the points table, the two-time finalists couldn't make use of the great start they made in the opening game against ATK. Since then, the club went on a massive winless streak which ultimately led to the sacking of David James. When Nelo Vingada took charge later on, the playoffs were out of hand for the team. They have 14 points this season with 2 wins and 8 draws. NorthEast United are facing Blasters with the excitement of making their first ISL playoffs in the 5 seasons. The Highlanders had things going their way from the beginning of the season. With Bartholomew Ogbeche being the face of attack, NEUFC had their longtime worry of goal-scoring solved this time. Eelco Schattorie having the best plans in house, NorthEast was a much-improved side throughout these months and deserved a spot in the knockouts. On the points table, they are 4th with 28 points from 17 games. Kerala Blasters does not have any injuries or suspensions. Mato Grgic will be out for NorthEast United due to a fourth yellow card. Kerala Blasters will have Matej Poplatnik act as the centre of attack. The Slovenian striker is the club's joint-top scorer this season, with 4 goals from 15 games. If the accurate and sharp passes from midfield reach the 26-year-old, there wouldn't much trouble in giving the NorthEast defence some hard time. NorthEast United has one of the most clinical strikers of ISL Bartholomew Ogbeche with them. The French striker has 12 goals this season and would find the Blasters encounter as an opportunity to increase the tally. Ogbeche would be sufficient for Schattorie to leap into the timely mistakes from the Blasters back-four. While one team has struggled to the maximum this season, the other has had a merry time. NorthEast United would be determined to storm into the playoffs with the maximum number of points and is expected not to take the game lightly. If fielding with a decent XI respecting the hosts, they would have another win in the pocket.